The benefits of hydrogen are fairly obvious. It would almost necessarily be a domestically produced material with few environmental shortcomings if made by clean processes. The challenges to be overcome are many and varied, though – with the biggest obstacle to wide-spread use being in the distribution of the fuel. The U. S. Department of Energy, on its Fuel Economy.gov web site, concedes, “The current infrastructure for producing, delivering, and dispensing hydrogen to consumers cannot yet support the widespread adoption of FCVs (fuel cell vehicles).” As different strategies are tested and adopted, this is likely to change, as are the costs for fuel cells and their longevity. Auto makers, working to bring FCVs to market, have dropped prices from the million dollar estimate for a Honda Clarity at its introduction to a few lucky individuals in 2008 to the projected $50,000-$100,000 price range at which its successor, the FCV, might be introduced today. The same type of controversy surrounds this pricing as that around Tesla’s vehicles and Nissan Leafs. Are the car companies taking a beating on these prices to ramp up large enough production runs to benefit from the economies of scale? How long before this scene becomes a common as pouring gasoline into a car’s tank? Critics of fuel cells point out that the stacks can deteriorate noticeably in performance after as few as 30,000 miles. Car makers have boosted this to 75,000 miles according to the DOE, and will count it as a success if they can achieve 150,000 as a reliable lifetime for the cells. As always, tested and proven existing technologies tend to have the advantage over new devices. Your editor’s 1995 Subaru Impreza, for instance, while looking a little battered like its owner, has 243,000 relatively trouble-free miles. With at least short-term gas prices dropping to 2010 levels, it will be harder to sell people on EVs, even with their lower long-term operating costs. One approach that combines production and distribution through existing infrastructure is to solar and wind energy to produce hydrogen and move it through the 2.44 million miles of natural gas pipelines already in place in the United States. Combining natural gas and hydrogen in the same pipes is a natural outgrowth of H2’s extraction from natural gas and methane today, and could eventually lead to hydrogen only flowing though the pipelines. Other forms of distribution come with their own sets of problems. 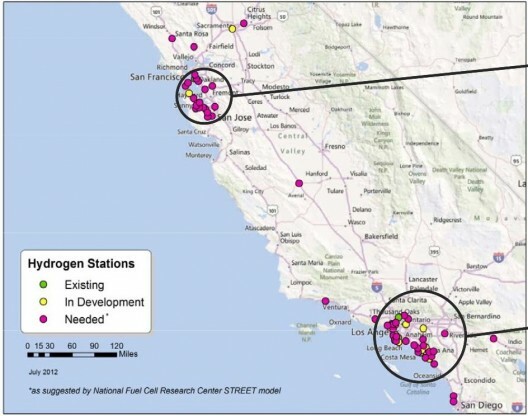 Making hydrogen at a large facility and then hauling it to local H2 filling stations defeats part of the purpose in making the clean fuel, probably requiring the fossil-fuel infrastructure for transport. Making the hydrogen locally, or even on site, removes that impediment. Producing H2 with wind or solar power, compressing it and storing it on site at the “filling station” would be as efficient as possible. 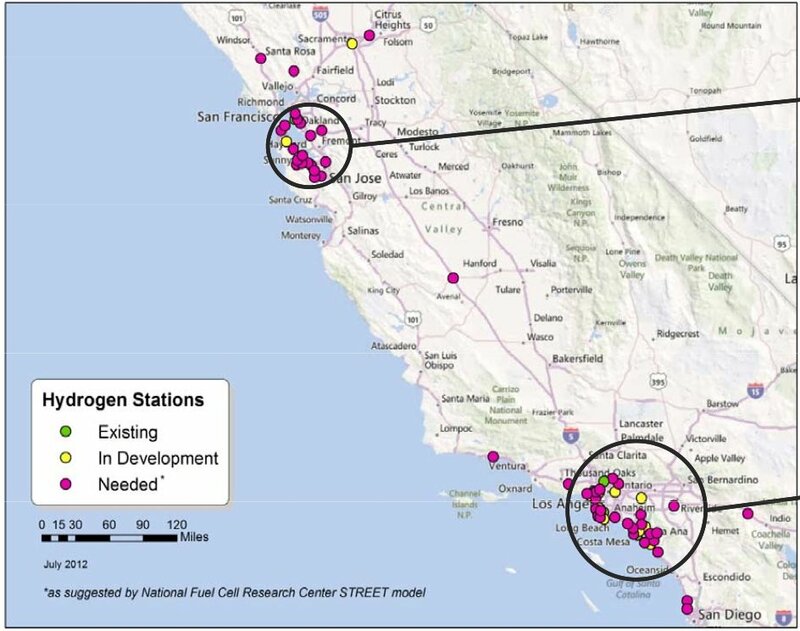 Existing and planned H2 stations in California are concentrated in two high-population areas. The rest of the US has fewer public stations. The next and final installments will look at a few variants in what hydrogen filling stations look like, the many players invested in delivering fuel at a commercial level, and the great promise of home fueling stations. The vast majority of EV recharging is done at home, and a hydrogen equivalent will be necessary to make FCVs as viable as their battery-powered cousins. In case this seems unlikely, think of gasoline-powered cars at the beginning of the 20th century. Creation of the infrastructure and development of fuel stocks that would reliably power the new motor cars was a massive undertaking, one that had promises of great wealth, but also had enormous difficulties. This Shell Oil review of the company’s early history gives some insight into what a heady undertaking that was. Much like early adaptors of motor cars, an EV driver has to find a compatible charger and make a payment for its use in some standardized way. According to Business Week, this is one of the more frustrating parts of owning an EV today. 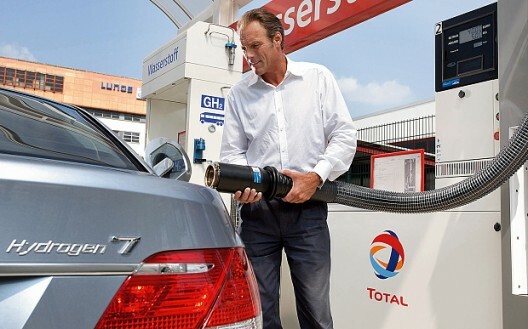 H2 stations will need standardization, and major car makers are giving free fill-ups partly because it’s difficult to put a price on the commodity at this time. Just as battery-powered cars are just now getting the massive investments it will take to make them as common as today’s fossil-fuel burners, FCVs are lagging, but probably will begin an accelerated development cycle in the next few years.